One of the main reasons people go into business for themselves is so “they can be their own boss.” They are tired of making someone else rich and having to do what someone else wants. They want to control their life and their job. The problem is that their job is paying pretty well. And it’ll take years before their business equals their current income. One of the other main reasons people want to get into junk removal business on their own is because of their current job. It is also one of the main reasons people never leave to get started. In this graphic you see how long it will take in junk removal, on average, to equal the amount of money you are currently making. Somebody that makes only $25,000 will equal their salary sooner. However, it is less likely this individual will be able to be as aggressive on advertising as individuals who make more money. People that make more money will have a greater likelihood to have saved up some extra money to invest in more aggressive advertising and training, so they have increased the likelihood of success. However, the downside for them quitting their current job to start their junk removal business increases. They say, “Let me save up ‘X’ amount of money before we start” or “Let me wait another year or two.” Every day you wait to get started increases the probability that you never start. So JRA has a strategy for you to get going without having to quit your job. 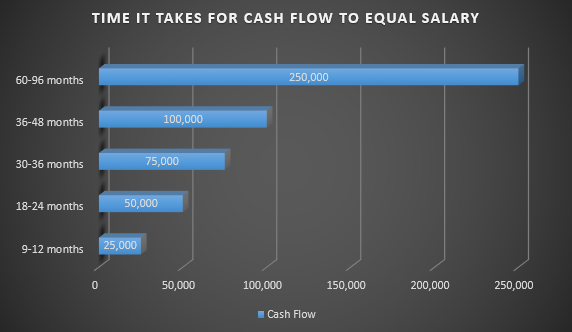 A strategy that will help you start seeing positive momentum forward and decrease the time to equal your salary once you finally do get started. The main reason that it takes a long period to reach the amount of money you are making at your current job is that you have to build up your customer base. You’ve got to reach enough people and do so in a way that makes them call you and schedule. Most people go to the internet now to research companies they are going to hire. If yours isn’t positioned well on the web and does not instill confidence in searchers that your company is going to do a great job, then they won’t choose your company. This strategy will allow your site to be positioned where people find it and project to the customer that you are professional and know what you are doing, even if you have yet to have done a single junk removal pickup. The way to get the ball rolling on your business without quitting your current job immediately is to get a professional website and begin the process to get it to rank well on Google organically. Search Engine Optimization is the process of getting your website to rank well organically. It is very much an investment in your companies future and the amount of time it takes to see results will vary based on your market and what type of SEO the competition in your market is doing. At JRA, we typically have found we can have most websites on the first page with most major keywords around 3-6 months. To get a page to rank well in Google maps can take between 6-12 months. And getting a new page to rank in the top four results for many keywords can be accomplished between 6-12 months, on average. So within those time frames, people are finding your site, and the image that is portrayed on the page will instill confidence that you know what you are doing, even if you are questioning that yourself. Once the page gains rankings, your phone will begin to ring. As you begin to get calls and inquires about your junk removal business, you will know that the momentum is building and you begin to see the light at the end of the tunnel which is you leaving your current job. At this time you should consider doing these jobs after work or on the weekends. That way you can begin building a customer base who will use you again. Then they will refer you to friends and leave a review online. One of the main issues you will have with this strategy once the phone rings are that the phone needs to be answered. The JRA call center can take those calls once they start coming. We will include the call center in with your website and ongoing SEO services until your call volume begins to pick up. That way no calls will get missed, and you don’t have to answer calls for your new business at your current job. This strategy does have a few downsides. Since you are working your current job, you likely will not be able to accommodate same or often even next day service. That does mean that you will miss out on some work. However, many people will still do jobs with you, and you can keep a tab on the ones you miss to understand how much money could have made had you been able to do same or next day service. That way you will have a reasonably clear picture of the demand you will have once you do go full time into your new business. This is dependent on how much money you are currently making. But chances are you will know when the time has come. You will be getting books for several days for your off hours time slots. Your Saturday and possibly Sunday will have several jobs. And you will be missing out on work because your turn-a-round is not quick enough. You will want to see this consistently for a period of a minimum of two weeks. You likely will want to wait around a month. As SEO rankings rise they sometimes fluctuate. Your business is going to be dependent on good rankings. So you want to make sure that your rankings are doing good already before quitting your job. Then start focusing on working with your new business. After quitting your current job, you need to go full force into your junk removal business. Put up Craigslist ads daily. Make sure you answer phone calls promptly. Make sure you are responsive on Yelp. Get some reliable employees. And start Google Pay Per Click (PPC) advertising. PPC is an excellent way to begin to bring in even more jobs. The profit margins are thin on PPC in some markets due to higher cost per click costs from competitors driving up bids. However, this will keep your truck busy, keep your employees getting hours, and most importantly, is a potential repeat customer who is going to refer you to friends and leave a review online. PPC is a required part of the marketing snowball that is going to lead to your long-term success in junk removal. It’s all about doing as many jobs as possible and doing them well, so those customers use you and tell others about you again. You Have To Start in Junk Removal! There is no telling what great companies the world has missed out on. Because an amazing idea or outstanding individual never took the chance to branch out on their own. Your current job might pay well and offer great benefits, right now. But you are still answering to someone else, and someone else ultimately controls your fate. If the business slows down all of a sudden, your secure job doesn’t appear all that secure. Take steps TODAY to become free and control your future. Contact JRA at 919-617-1975!